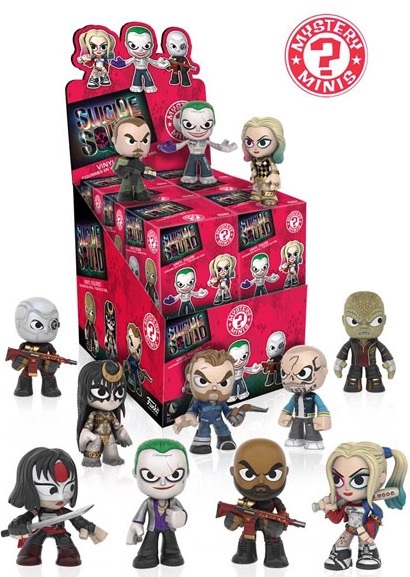 Building on the options geared to the Suicide Squad movie, 2016 Funko Suicide Squad Mystery Minis offer shrunken versions that largely mirror the Pop! editions. This includes several exclusives specific to GameStop or Hot Topic and multiple figures for Harley Quinn and The Joker. Shop for Funko Suicide Squad Mystery Minis on eBay. 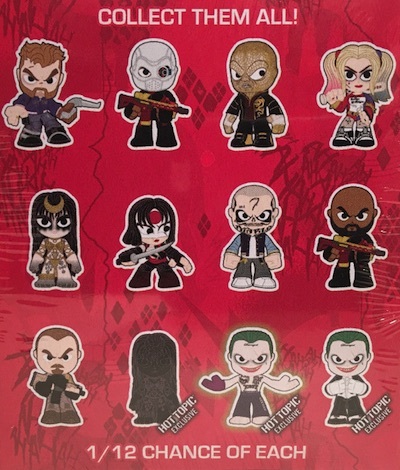 Issued in a blind-box format, by the case, 2016 Funko Suicide Squad Mystery Minis follow the main Pop Suicide Squad figures. This means figures for most of the main characters from the film as well as a mix of figure designs for two of the biggest names in Jared Leto as The Joker and Margot Robbie as Harley Quinn. 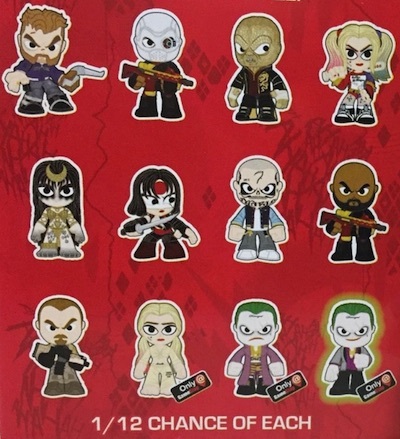 While the exclusives add more work, specific rarity for 2016 Funko Suicide Squad Mystery Minis is consistent across all formats with 1:12 odds. Each figure is approximately 2 1/2" tall. Specific figures available at GameStop and Hot Topic are shown below. Harley Quinn Gown is which store’s exclusive? Brent Castro � Not sure. Three separate groupings were released: one for the main set and one each for Hot Topic and Gamestop. The Harley Quinn Gown is shown in the main image. You never pointed out the glow in the dark Jokers that are Gamestop and Hot Topic exclusives (one per store). You picture them but don’t mention them (they’re the ones with the slight halo around them). And the gown Harley is party pod the basic set, not an exclusive. Wow. Sorry about my spelling errors. My last name got auto corrected wrong and “part of the basic assortment” got badly twisted. My fault. This is why I don’t like doing this from a phone, Hahaha.